I received another offer to review a book just recently and couldn’t pass it up. The cover and title sounded very interesting to me and certainly with my graphic design and 3D animation business, I thought there would be many things to learn and discover in the book. First, the book is a large book and about 140+80 pages (more on that later) and a quick thumb through it leaves you impressed with the many visuals and color pages, yet scratching you head as to how its put together. The reason; This is NOT an ordinary book. And I loved that aspect of it. From the first few pages to the back of the book, you quickly encounter the fact that the book reads from both ends and has what you normally expect at the start or end, quite out of order. This showed me the creative aspects and anarchy topic of the book right from the first few pages, which I thought was just great. The first half is about graphic design rules and what is typically done and why. It flows through 10 rules, exploring each topic with examples, tips and content to learn. I found most of this information fairly uninspiring, but nonetheless, good information and some useful tips and examples, as well as at least few new points of knowledge on each of the 10 rules. They include many inspiring stories, examples and exercises you can do to expand your thinking and designs into what is beyond the normal rules of design. It sparks a lot of ideas reading through the many examples and business cases described, so should help instill new ideas and methods to any design artist or creative individual. The thing that left me wanting were branching into other graphic areas, like animation, computer illustration and 3D design. Animation was not even mentioned and 3D came from a sense of physical 3D, not computer graphics or 3D printing. As a 3D artist doing graphic design solely in 3D animation, I was disappointed that these areas were not covered in a current book on design and creativity. However, there is more than enough references to other styles and methods that this did not take away from the book and the creativity it helps tap into. There were a number of examples of design for websites, but again, there was very little coverage of workflow and usability, which I consider to be the critical piece of creative design as a software developer. I think concepts from the rest of the book can be applied here as well, but I would have loved to see more on the design aspects and creative aspects of software and computer imagery. Overall, I think there is a lot to learn from this book and although it covers traditional print design thoroughly without exploring new design concepts like 3D print or animation, I think it has more than enough to spark new creative vibes and gives a load of examples and inspiring content to help any designer bring some new methods and ideas to their own workflow. 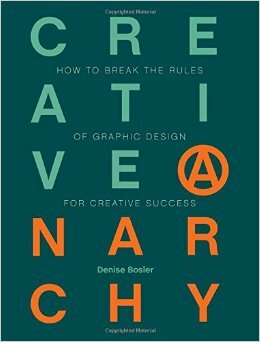 The whole concept then of breaking some of the rules to find that creative success is an excellent one and nice to see that this book make a great example of what it is teaching by breaking the rules itself.